Inspired by classic watches designed between the 1950s and the 1970s, this sophisticated Tudor Style Watch epitomises vintage charm. This timepiece is presented within a 28mm steel case with a stainless steel and yellow gold double bezel. The distinguished champagne diamond set dial is equipped with striking gold-toned hands and is protected by a clear, protective, scratch-resistant crystal sapphire lens. 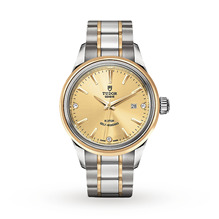 Powered by a self-winding mechanical Calibre 2671 movement with a power reserve of approximately 38 hours, this high performance timepiece also features a date display window at 3 o’clock, water resistance to 100 metres and a steel screw-down winding crown, marked with the iconic Tudor logo. A polished stainless steel and yellow gold bracelet with a folding clasp and safety catch completes this watch.